Even more exciting than my experiments with pressing eye shadow are the two blush palettes I recently made. These were the main reason I ordered from TKB Trading and I'm so excited about them! I've only started getting more into blush over the last few months and in this case, I really prefer pressed over loose. I'm quite fair and I find pressed easier to apply and less prone to over-application or streaking. There are, of course, companies that sell healthy pressed blushes, but needless to say, I was still inspired to make my own. Unlike the shadows, these are colors I mixed up myself, which makes the end result that much more satisfying. To make these, I used approximately a 2:1 ratio of pigment to base. The base improves adhesion and slip and also helps prevent streaky colors. Keep in mind that the base ingredients will lighten your colors, as well as determine how pigmented the final product will be, but you can control this by playing with the ratio of base to pigment, depending on your desired result. For my base, I used TKB's Matte Texture Base for Eyes, which is a combination of titanium dioxide, mica, and magnesium stearate. 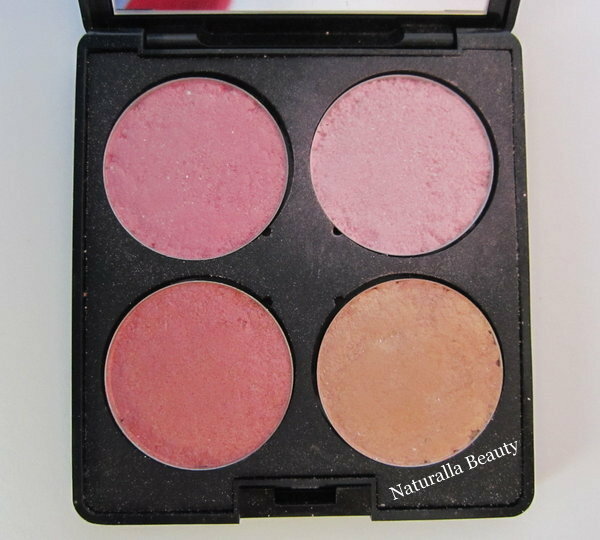 I like my blushes to have a sheen, but nothing too overpowering or shimmery, so I was hoping the Matte Texture Base would help tone down the shimmer without making them completely matte. I also added a small amount of kaolin clay, which helps with wear and oil control, and I'm quite happy with how the combination turned out. Once you've mixed up your dry ingredients, the process is identical to pressing eye shadows. I used 36mm pans and about 6 drops of fractionated coconut oil per blush. Then I added 99% rubbing alcohol until I got my desired texture. You'll be able to see in the above photos that many of the edges of the pans don't look perfect. I find it easier to press with a crumbly, wet sand texture, as opposed to anything wetter, but it does make it more difficult to get a perfectly smooth edge on your pans. This was the first one I made and it's literally just TKB's Be My Valentine mica (plus the base ingredients.) 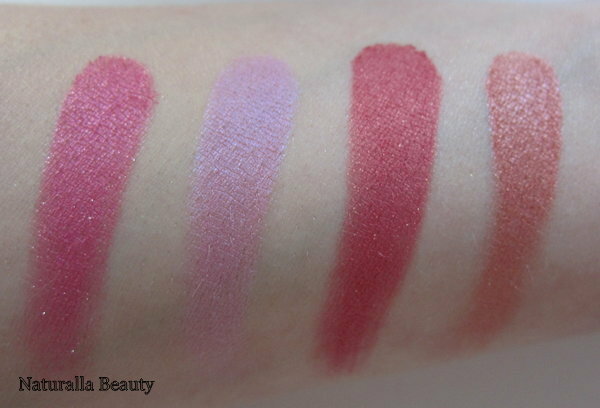 Be My Valentine is a super pretty, dusky, rosey pink with gold shimmer. Again, not my most creative colour, but one of my favorites nonetheless. For color, I used only Apple Blossom mica, which is a soft pink with a low sheen. 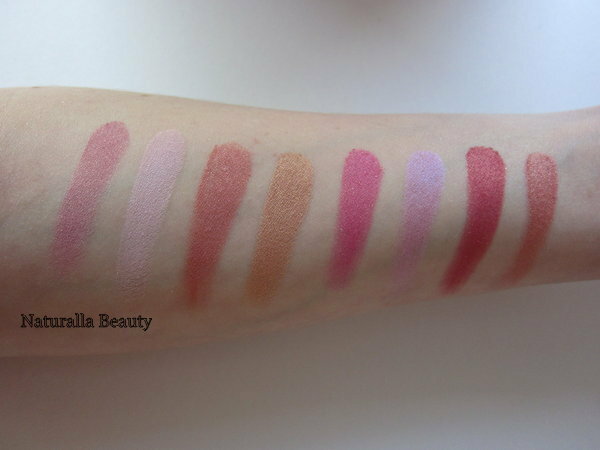 It looks incredibly pale both in the pan and swatched, but on my fair skin, it gives a lovely, natural flush. For me, it's definitely not one of those blushes that are so pale as to be invisible, but I'm not sure how it would fare on darker skin tones. Peach and coral blushes are usually my favorites, but I guess I didn't buy the right micas for those, as all I can seem to come up with are these orangey/terracotta shades. Still pretty, don't get me wrong, just not exactly what I was aiming for. This one was made with a combination of Bolera and Cloisonne Red micas. I wanted to make a highlighter shade, but again, I don't think I picked up the ideal micas for what I was going for. Even sheered out, this is a little too dark for a highlight on my fair skin, though it does makes a pretty eye shadow. I used a combination of Apricot and Bronze Fine micas. 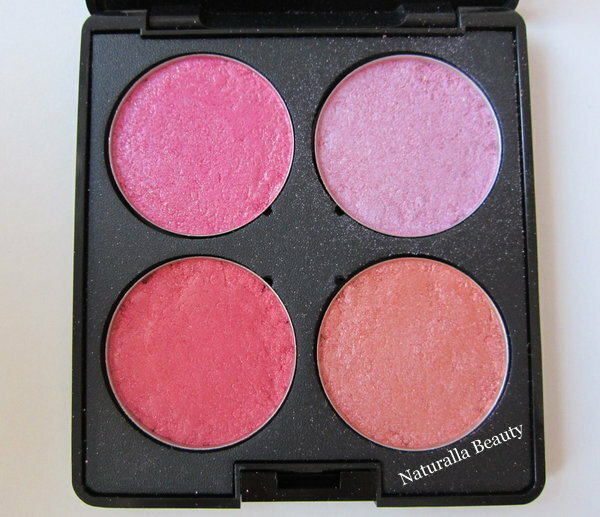 I don't think any blush palette is complete without a bright pink and this one certainly delivers. I used Cloisonne Red mica combined with a sample of Shiro Cosmetics' Because We Can eye shadow. The result is a hot pink with a small amount of silver shimmer. This is one of the more pigmented blushes I made and it's one I make sure to apply with a lighter hand! I love pink lip colors that have just a hint of purple, and I was going for the same thing with this blush. I used Pink - Red/Blue mica, which is a pink with a blue/purple duochromey glow, and toned it down a little with some Apple Blossom mica. The result is gorgeous, if I do say so myself. At first it looks like your average light pink, but when the light catches it, it gives off the prettiest violet glow. In trying to make a well-rounded array of blushes, it seemed only natural to make a red-toned shade. I used Cloisonne Red combined with a sample of Detrivore Cosmetics' Hemoglobin eye shadow. I love how this turned out, though I haven't quite worked up the nerve to wear it on my cheeks yet. For my second attempt at making a coral shade, I went about things differently, but still ended up with a pretty similar color. I used a very small amount of Bolera mica with a sample of Shiro's Mew eye shadow and a smidge of Concrete Minerals' Napalm eye shadow. I like this one more than the first try - it's a little more orange and a little less pink - but they end up looking pretty similar on the cheeks. And that's all the pressing I've done so far! Overall, both were a success, but I definitely reach for the blushes a lot more than the eye shadows. They're pigmented, but not overly so and they blend nicely without any streaking. I do find some colors have better longevity than others, but all of them last pretty much the whole day. I still want to make a highlighter that's more suited to my light skin and that illusive peach blush, as well as maybe a bronzer shade or two, so I wouldn't say my pressing experiments are over just yet. Perhaps halted though, since I think I'll need to pick up some different ingredients before attempting those. If it wasn't obvious already, I'm on a bit of a blush kick, so I have to ask - what are your favorite blushes? All the better if they're pressed, but I'm open to any and all suggestions! The pale violet is beautiful! Ive actually been looking for a color like that. Maybe I'll try to make my own sometime. I prefer pressed blushes too especially for travelling. All of these are really lovely! Thanks! That's one of my favorites too :) It's definitely worth giving it a go - the whole thing was a lot simpler than I was expecting. Thanks! I'm really happy with how they turned out. These sound/look amazing! This is definitely something I want to try as I hate the mess that loose products make! Thanks! I've wanted to try making my own for a while :) I had a lot of fun making these! It is fun! I haven't tried pressing with anything else, but from everything I've read, it seems like the most popular non-silicone option. Any oil should work, but the FCO has a pretty much indefinite shelf life so you don't have to worry about it going rancid and ruining your product. Have you tried pressing matte shadows? Hi there! 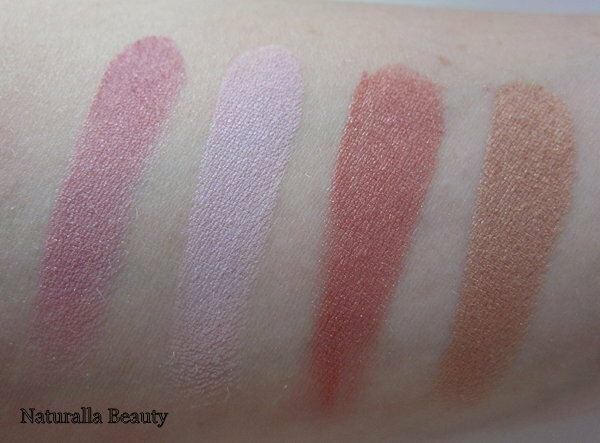 What was your ratio of mica to base for these blushes? Thank you! Thank you very much! That was helpful =) I appreciate it! What is the purpose of the rubbing alcohol? Sorry! I'm trying to figure out how much to purchase. You need the overall texture to be moist, similar to wet sand, so you can press it into the pan. You also need something that will evaporate pretty quickly, leaving you with a dry pressed powder. More oil will give you a greasy shadow and something like water or glycerin leaves you open to mold and other nastiness growing, which is why rubbing alcohol is the perfect thing :) Hope that makes sense!